I am finally going to be bringing you a review/giveaway of a product that is very near and dear to my heart...because I invented it! 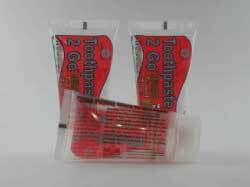 Let me introduce you to the revolutionary toothpaste transfer device, Toothpaste 2 Go! Now, you may be thinking that revolutionary is probably too strong of a word to describe a product that simply allows you to create your own travel-sized tubes of toothpaste from a full-size tube of toothpaste, but here's where I have to disagree. There is no other product like this on the market today! And after much pain-staking research and experimentation, I'm happy to announce that the Toothpaste 2 Go toothpaste transfer system will work with virtually ANY toothpaste tube, is 100% reusable, dishwasher safe and will save you plenty of money! Keep reading to learn more! 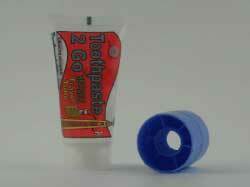 The Toothpaste 2 Go Starter Pack retails for $11.99, but is currently on sale for $7.99. An additional 3-pack of travel-sized transfer tubes retails for $5.99, but is currently on sale for $3.99. Receive FREE SHIPPING on all orders over $15 (no coupon code necessary) and 10% OFF your entire order with "MOMMYLIVING10". Ever wonder why travel-sized toothpaste is so very expensive? It can cost anywhere from $1.00 – $3.25 (depending on the size and brand) just to buy your regular toothpaste in a travel-sized container. Why Pay More to Get Less? Ever get frustrated because you forgot to buy the travel-sized toothpaste before your airline flight and now you can’t take your full-size toothpaste in your carry-on luggage? This Doesn't Have to Happen Any Longer! Ever wish that you had several small tubes of toothpaste at the ready so that you could easily keep one in your purse, desk drawer, car console, etc. for easy access in order to keep your teeth healthy and pearly white? Your Problems Have All Been Solved! 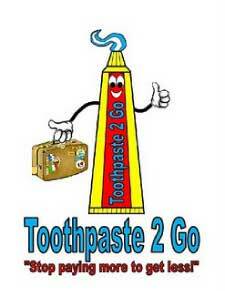 Introducing Toothpaste 2 Go, the revolutionary toothpaste transfer system! This system allows anyone to convert their full-size toothpaste into as many travel-sized containers as they want…WITHOUT PAYING MORE MONEY FOR THE SMALLER SIZED CONTAINER. The UNIVERSAL DEVICE attaches onto ANY TOOTHPASTE TUBE allowing you to fill a specially designed REUSABLE and DISHWASHER SAFE travel-sized tube with your regular toothpaste. Now, you can pack for your flight and not have to worry about buying those expensive travel-sized tubes. You can also make as many of these as you want, so that you can keep a tube of toothpaste nearby at all times. This is especially helpful for children with braces who need to brush while at school. And, most importantly, you will be saving money each time you make your own travel-sized toothpaste tubes using your regular toothpaste! Just look at how easy it is to do! Disclosure: This product review may not be the most objective or unbiased since I am the inventor of Toothpaste 2 Go and MCM Inventions, Inc. is my family's small business.